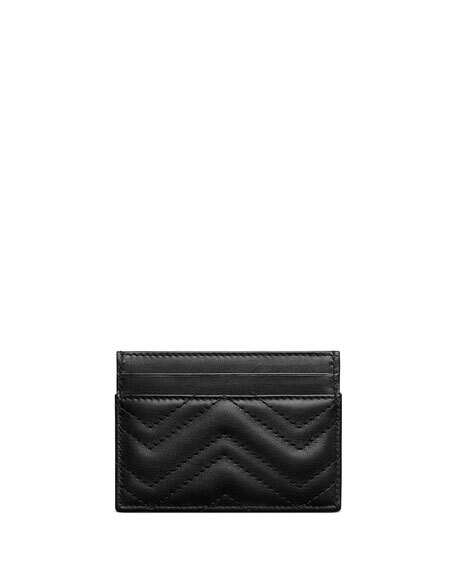 Gucci matelassé chevron leather card case. 2.8"H x 4"W x 0.3"D; weighs 1.2 oz. Gucci camera bag in matelass?? chevron leather with heart on the back. Chain strap with 23.5" drop. Double G detail. Gucci camera bag in matelass?? chevron leather with heart on the back. Chain strap with 23.5" drop. Double G detail. Inside, two card slots and three zip compartments. Moir?? and sueded microfiber lining. 4"H x 7.5"W x 3"D. Made in Italy. Gucci card case in matelass?? chevron leather with GG on the back. Double G hardware. Four card slots and one bill compartment. Two flat pockets. One zip pocket. Closed: 3.5"H x 4.5"W x 1"D. Open: 7"H x 4.5"W. Made in Italy. Gucci card case in GG Supreme canvas. Flap top with snap closure. Interior, leather lining; zip pocket. Five card slots. Gucci card case in GG Supreme canvas. Flap top with snap closure. Interior, leather lining; zip pocket. Five card slots. 3.5"H x 4.5"W x 1"D. Made in Italy. Gucci "Ophidia" card case in suede with patent leather trim. Signature interlocking GG stud and blue/red/blue Web. 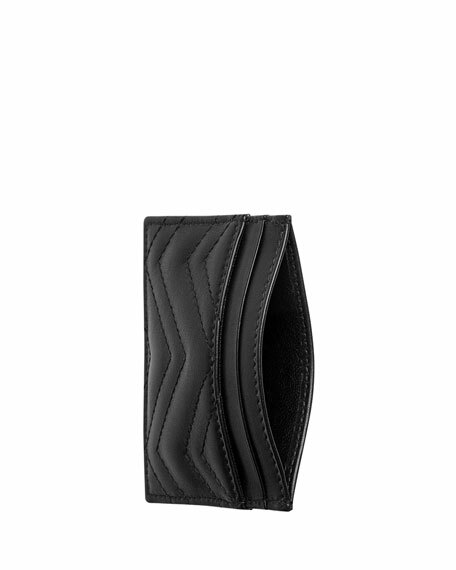 Top slip pocket; two card slots on each side. 2.8"H x 3.9"W. Made in Italy.